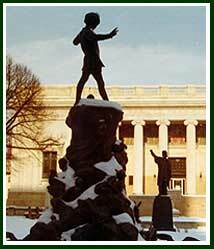 Sir George Frampton's sculpture of “Peter Pan” which graces at the entrance of Johnson Park in Camden, NJ is one of only five in the world. The other four statues are located in Kensington Gardens, London; in Sefton Park, Liverpool, England; in the Gardens of the Egmont Palace, Brussels; and in St. John's, Newfoundland. 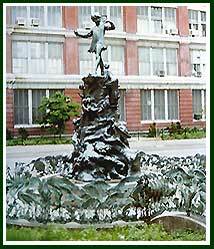 Eldridge Johnson presented the statue of Peter Pan, cast in bronze and surrounded by fairies, bunnies, and other small delightful critters, as a gift to the children of Camden. 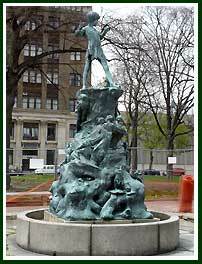 The statue was dedicated at a magnificent Peter Pan Pageant on September 24, 1926, where over 3,000 schoolchildren from Camden, Merchantville, and other nearby towns depicted scenes from the J. M. Barrie's story of Peter Pan . The sculptured bronze "Lily Pond Railing" by J. Otto Schweitzer, installed in 1930, is one -of-a-kind work depicting a marshland habit of reeds, graceful herons and arching fish. Large sections are missing, but the Friends of Johnson Park plan to repair and replace the existing portions. 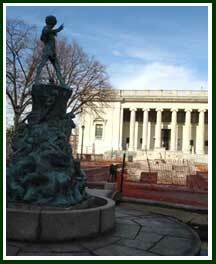 Other bronze pieces in the Park are by Philadelphia sculptor Albert Laessle. 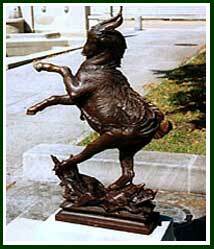 According to John Giannotti, professor emeritus of fine arts, and member of the Friends of Johnson Park, some of Laessle's works were commissioned especially for Johnson Park, while others, including "Billy," a playful goat, were cast from the original mold. 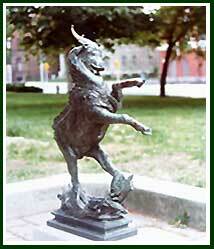 “Billy”, “Dancing Goat”, “Pan”, and “Turtle and Duck” are among the whimsical additions to the park by Laessle. Dr. Roberta K. Tarbell, Associate Professor of Art History at Rutgers-Camden, mentioned that the Pennsylvania Academy of Fine Arts in Philadelphia has five bronze sculptures by Albert Laessle. These sculptures are listed in the Academy's catalogue, American Sculpture in the Museum of American Art of the Pennsylvania Academy of the Fine Arts (1997). Professor Tarbell also added that another cast of Laessle's goat, usually surrounded by happy, playful children, can be admired at Rittenhouse Park in Philadelphia, PA.